Many of us don't realize the environmental impact of our shipping needs. From paper waste to the fuel used for air shipments, there's a lot we need to consider when mailing out packages. 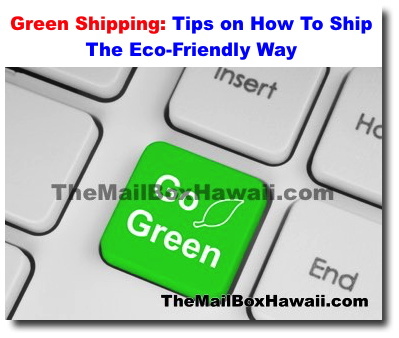 Here are some tips to stay eco-friendly when preparing and shipping packages. 1. Choose ground shipping whenever you can -- Ground shipping uses less fuel than air so if your package does not need to be shipped overnight, it's best to opt out of any service that will require air if it's not extremely urgent. 2. Pack and Ship items together --Instead of splitting up items that can be combined into one larger container, considering combing them into one box. If they're going to the same place anyway, using only one container (if they're going to the same address anyway) will help reduce emissions and paper waste. 3. Reuse packaging materials -- Instead of throwing out packing peanuts and bubble wrap from that last package you received, save it for next time. You'll never know when it will come in handy when you need to ship out items yourselves.